Dune Messiah is the second book in dune chronicles series. This book start after twelve years of the events of the first book Dune. You can find the review of Dune chronicles book 1 – “Dune” here. Unlike “Dune” which deals with a prophecy, noble houses, controlling Arrakis home to a very rare & most valued spice known a melange and revolution brought by Atreides in Arrakis and fulfillment of Fremen prophecy of coming of Mahdi, this second book deals with personal struggle of Paul Atreides – most powerful emperor ever ruled and conspiracy to topple Paul as emperor. 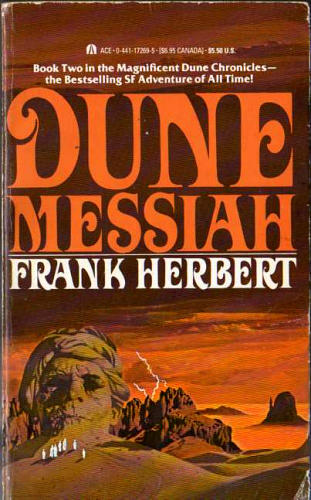 In a way Dune Messiah is the compilation of first book Dune, you can say it’s part two of book 1 instead of saying sequel or separate book. If you read both books – you will realize that this book brings a perfect conclusion to the events started in Dune. Paul Atreides is now in control of Arrakis and most importantly the spice melange without which the Guild steersman cannot navigate the space, without which the Bene Gesserit Sisterhood would lose there power, without which millions people could die from withdrawal and without which Arrakis won’t be so valuable planet. History is evident that when someone holds such a power (melange) their always will be someone who wants that power for themselves. The Melange is more than a power its drug without which the Guild and Bene Gesserit Sisterhood would be powerless. So they all along with Scytale – A Face Dancer (Tleilaxu Face Dancers had the ability to take on the physical appearance of other individuals.) hatch a conspiracy to topple the governance of Atreides. The Tleilaxu Face Dancer Scytale gives Paul a gift he cannot resist: a Tleilaxu-grown ghola of the deceased Duncan Idaho, Paul’s childhood teacher and friend, now called “Hayt” with a mission to kill Paul at an appropriate time. Overall the book is excellently written and great conclusion to the events started in book 1 of Dune. And burnt out both his eyes! And made himself a saint. Paul Atreides, ruler of a thousand planets, great victor of a holy war, prince turned revolutionary leader, messiah of a fanatical religious sisterhood, is to be brought low by the very forces that created him. Yet foreseeing the plans of his enemies, he determines to drive on towards his own, shockingly different, vision of the future.